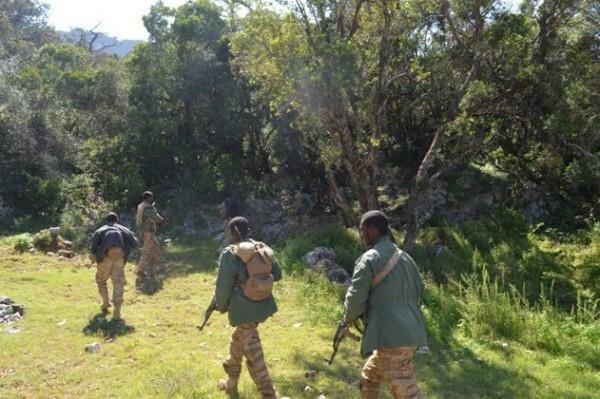 Somali rebel group Al-Shabaab assaulted a military base Thursday in the northern region of Puntland and separately ambushed an airbase in the south-central Middle Shabelle region. The attack in the semi-autonomous Puntland region started with suicide blasts at Af-Urur army camp, which is located about 100km west of Bossaso town, said military officer Nour Hassan. Sheikh Abdiasis Abu Musab, al-Shabab's military operations spokesman, claimed responsibility: 'We are behind the attack.' He further claimed that they killed at least 61 soldiers and overran the base, but Puntland's government denied this. Speaking to journalists in Garowe, Minister of Security for Puntland State Abdi Hersi called the casualty claims 'false' and blamed Al-Shabab for killing local elders, women and children who lived near the army base. Abdi Hersi admitted only that a few of soldiers died in the assault. But news outlet Voice of America cited military officials and witnesses as saying the death toll was at least 45 Puntland soldiers and five al-Shabab militants. Freelance journalist Hassan Heykal told The Messenger that he saw dozens of wounded soldiers brought to hospitals in Bosaso town. A Puntland military source told VOA that their forces retreated from the camp for 'tactical reasons' before launching a counter-assault and retaking it. The militants destroyed part of the base and burned dozens of military vehicles, witnesses said. According to a VOA reporter, citing Puntland sources, about two companies of Somali troops were at the camp when attacked. The commander of the troops at Af-Urur, Col. Warsame Muse Sangal, his deputy and a third commander are among the 45 dead. Separately, rebels operating in the south-central Middle Shabelle region ambushed security forces Wednesday night at the airbase in Jowhar town, which lies about 90 km north of Mogadishu, killing at least three soldiers. Police captain Khalif Abdulle told The Messenger Africa that at least three soldiers died and two others were wounded in the Al-Shabaab attack. 'It was a surprise assault which was launched by militants armed with AK-47s, machine-guns and RPGs but guards at the airbase in the town have repulsed the raid,' Abdulle said. while the Somali military launched counter operations to eradicate militants in the Middle Shabelle region. The attack comes days after at least six soldiers were killed in a roadside explosion claimed by Al-Shabaab near Jowhar town. Somalia's federal government recently held elections and has been widening its control over more territory since capturing Mogadishu from Al-Shabaab in 2011. The rebels are fighting to impose a strict interpretation of Islam on Somalia and they seek to overthrow the government and expel African Union troops.